Of all the kinds of pieces that comprise a jewelry collection, rings may be the most versatile in style, shape and expression. With the flash of a wrist or the touch of a hand, rings can convey a unique kind of style and a highly personal sentiment. And it’s an expression that’s contained in a subtly captivating way. Unlike a bold bracelet or chunky necklace, rings tend to offer a more muted allure, and require a much closer look to take in perspective its full fashion effect. Although an observer from afar most likely couldn’t describe a ring’s aesthetic qualities in detail, a more intimate observation can reveal true awe of a band’s intricate detail, refined elegance, or edgy draw. At SilverTribe, we’re proud to display a collection rooted in the belief that the most alluring kinds of jewelry are the most subtly stunning. All of our bands are crafted with the most meticulous care, containing intricate detail that’s truly awe-inspiring. And what’s more, it’s a collection rooted in an incredibly unique, naturally beautiful blend of southwestern color and design. 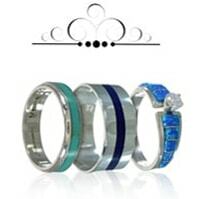 We encourage you to explore our hugely vast selection of captivating turquoise, opal, onyx, amber and coral rings from within our timeless sterling silver jewelry vaults. 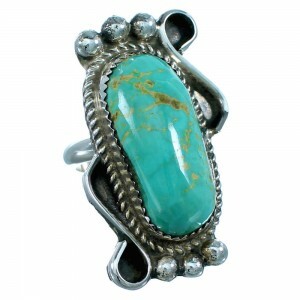 Of all the kinds of captivating rings contained within our sterling silver jewelry vaults, our collection of turquoise rings is arguably the most curiously alluring. 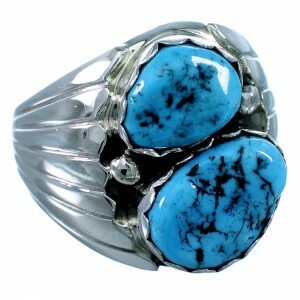 Painted with either a piercing light-blue hue or a more natural woody mixture, the spectrum of turquoise colors contained within our sterling silver rings is incredibly vast. 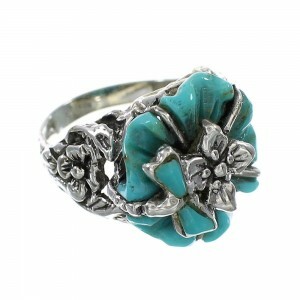 But it’s not solely a distinct shade that defines a particular turquoise ring. Each of our turquoise rings is inlaid with either a rustic or lustrous sheen of sterling silver, and contains incredibly intricate craftsmanship, detail and design. And while summery shade is rooted deep in southwestern and Native American history, the turquoise trend has spread like wildfire in recent years, especially among Hollywood’s most stylish starlets. 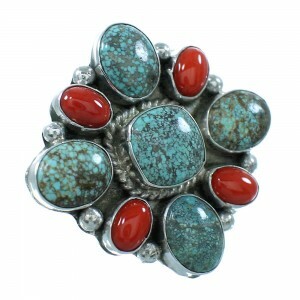 From Blake Lively to Beyonce, just about any red carpet fashionista has been spotted sporting stunning turquoise rings. 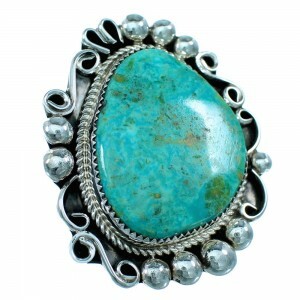 We urge you to explore our collection of turquoise rings and see what this curious hue has to offer. 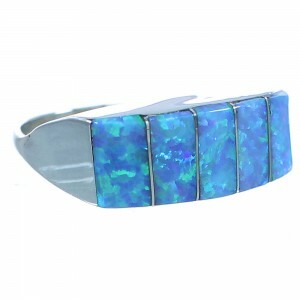 Another kind of stone that’s known for being a staple in southwestern jewelry collections is opal. Capable of boasting an enormous range of hues from bold navy to whimsical white, opal rings are capable of conveying an incredibly unique draw. But while the exact shade of opal tends to vary from stone to stone, it’s opal’s luminous and piercing finish that captivates its wearer. 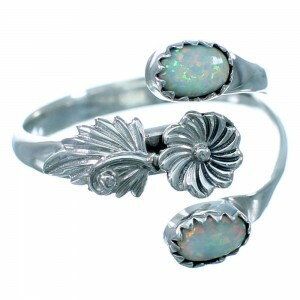 And when opal is contrasted with the shimmery shine or rustic, vintage-quality embedded in sterling silver, the show is simply gorgeous. Be sure to browse our collection of opal rings and find the perfect contrasting beauty to fit your tastes. Although black tends to be associated as one of the more muted and plain colors, when contained in the matrices of a lustrous stone, onyx’s allure is truly mesmerizing. Said to bestow strengthening and mind-invigorating qualities within its wearer, onyx’s shade isn’t its only deep quality. For centuries, Native American tribes indigenous to the southwestern landscape have used the precious stone for a variety of spiritual and aesthetic purposes. But though the stone certainly comes packed with its fair share of history, there’s no denying the stone’s unique elegance and darkened, deep – and somewhat dangerous – allure. An individual wearing an onyx ring is sure to attract the attention from more than a few curious onlookers. 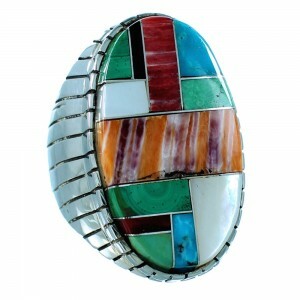 We encourage you to explore our huge array of intricately designed, darkly beautiful onyx rings. The majority of rings contained within SilverTribe’s sterling silver jewelry vaults are extracted from deep within the earth, containing some of the most naturally secret beauty on the planet. 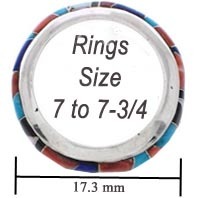 However, there’s one hue found in our inventory of rings that has a much more unique backstory. Amber, derived from ancient fossilized tree resin, is a highly organic piece. Although amber is, at its very core, ancient tree sap, its chemical reconstructing throughout thousands – if not millions – of years has transformed the sticky stuff into an incredibly lustrous and alluring piece. Amber isn’t quite clear enough to see through, yet it isn’t dark enough to be considered a rich stone. And it’s this somewhat puzzling contrast that tends to draw wearers in the most. We urge you to explore our collection of amber pieces from our timeless sterling silver jewelry vaults. Like amber, coral tends to be classified as one of the more organic kinds of stones contrasted with our sterling silver jewelry. Coral is the skeletal remains of coral polyps that grow and branch into marine reefs and atolls. However, not all coral skeletons are fit for molding into jewelry pieces. Divers must meticulously sort through a number of beds to find the perfect remains to ensure the stone’s stunning allure. Although coral tends to have a somewhat colored backstory, the hue’s enigmatically rich quality is undeniable. Coral has long been a color that has transcended time and trends, making coral rings a staple for any jewelry collection. Be sure to browse our collection of captivating coral bands and find the perfect piece to complement your confidence and unique beauty. At SilverTribe we’re firm believers that a jewelry collection should be both beautiful and affordable, and that style should never be sacrificed for cost. All of the rings, whether they be embedded with turquoise, onyx, opal, amber of coral gems, come with a price tag that’s not outrageous. And what’s more, all of the jewelry pieces contained within our vaults are presented with the utmost attention to detail, design and craftsmanship, making them truly one-of-a-kind pieces. 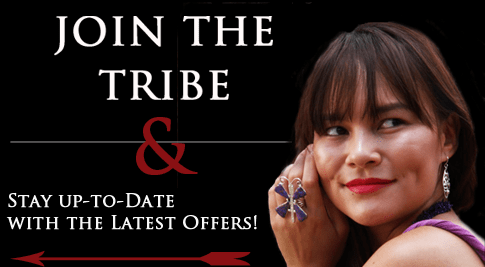 Be sure to sign up for SilverTribe’s email list and become eligible for exclusive promotional offers, giveaways, seasonal sales and style tips – at absolutely no cost to you.